In August of 2002 I purchased a half track from Owens Export Service in Upland, California. I am interested in any information that anyone has on this vehicle's history. This project started when I was looking for a World War II Williys MB Jeep to buy and restore. I have loved Jeeps since I was three, for my mother, Cheryl Leatherman has related the story of me saying that I wanted a real one even way back then. While I was searching for a MB Jeep, a website (www.owens-export.com) came up that had a few old Jeeps on page one of the “for sale” items. 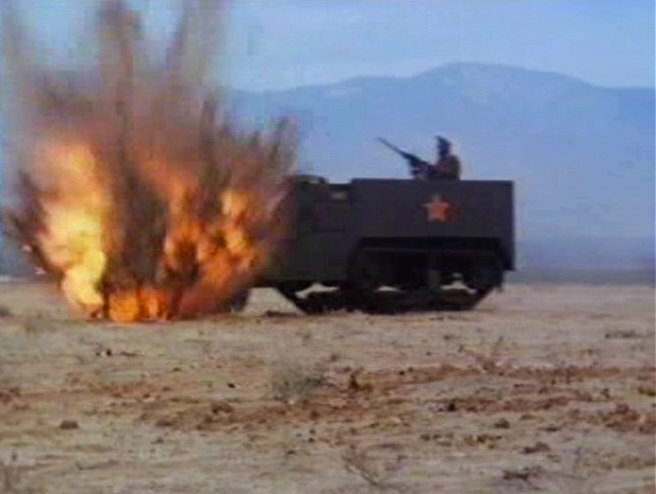 On page two, fate or luck stepped in for there was a WWII half-track there that looked in remarkably good shape. After taking some time, and thinking things over, I figured that this would be a most unique project as compared to a Jeep. After working out the details and final price with one of the owners of Owens Export ( Steve Kapito ), and thus my adventure began! I drove my 1998 F-700 dump truck from Albion, Indiana to Upland, California (a suburb of Los Angeles, California) to pick the half-track up. It was an amazing adventure for me, and I had a lot of fun doing it. The round trip was about 4,400 miles and took about eight days in all. On the way out I visited a good friend of mine, Bob Miller, who is a member of the New Mexico State Police. I did a “ride along” with him one evening on the way out, and on the way back. This was a one of a kind experience for me. Bob is a true professional and very dedicated. It was great to see him, for it had been several years since the last time we had seen one another. About the half-track, I know this much about it: This unit was originally built as an M15A1 in December of 1943 with the frame serial number of M15A1-1002; it was converted sometime in the late '40's or early '50's and is now an M16A1. I found the hood serial number (U.S.A. 40149719) after careful wet sanding. These numbers measured 1-3/4" high, which is not standard (I have yet to find out why they were this size vs. the standard 2" or 3" numbers). The unit numbers on the front and rear bumpers could not be made out. The half-track was at Universal Studios for the last 45 years or so before being sold to Five-Star Military Vehicle Rentals in 1992 and then sold to O.E.S. in 2002. It had not been started for 25 to 30 years, from what I was told, before I bought it. It was one of two half-tracks that were part of the “back lot tour” for many years. I even had seen them there in 1985. I never dreamed that one day I would own one of them. Steve at O.E.S. had indicated to me that the engine turned over freely, but that they could not get it to start. A few days after I returned home with it, I changed all the fluids, checked the compression (110 psi in all cylinders), install new spark plugs, turned it over (had excellent spark), added a temporary fuel source, turned it over again, and it started on the first rotation! This was all in a four-hour period. The engine ran remarkably well and did not smoke or leak oil. Also, all the wiring, connectors, and mounting holes are still on the vehicle for the gun mount. I did find out that I had a broken valve lifter after hearing a ticking noise, but that was easy enough to replace.... it took about four hours in all for me to do. I guess this is not too bad for it sitting all those years.... Could have been worse! 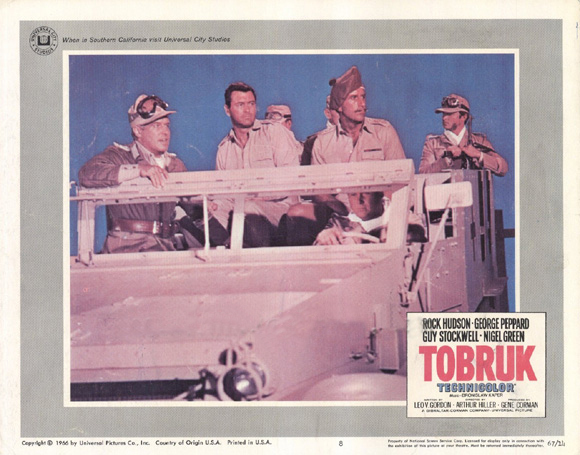 I e-mailed Universal Studios requesting any information they had on my half-track, and a person that works there e-mailed me and told me it was in the movies "Tobruk", "Play Dirty", and several others. He said it was used mostly as a German troop carrier during its career at Universal Studios. He did not elaborate further, and has not answer my several requests for more info.... that is why I am asking here. Also, it may have been used in the T.V. series "The Rat Patrol", but I have not been able to confirm this. I started sandblasting the half-track very carefully the last weekend of September 2002. I doing so, I found patched in armor cutouts, and as my friend Andy Sprague calls them, "poor man's" bullet holes that the studio cut into the passenger side armor with a torch. I also found all kinds of markings from the studio on it. I documented all the marking that I uncovered with photos and hand written notes. I found several markings with two upside down crossed sabers at the bottom with a design above them on an olive drab paint job. There were markings on the doors similar to the crossed saber motif as well, sort of floral like. Also, three different German markings were evident on tan paint jobs, as were a couple of US stars on olive drab. I also found some writing on the back passenger side that said “ VNITRNI BEZPEONOSTN” (on the same layer as the crossed saber emblems). I did a language translation on an internet site and it turns out that “VNITRNI BEZPEONOSTN” means “INTERNAL SECURITY” in Czechoslovakian. And there may be some old United Nations logos near the bottom layers of paint as well (they are circular and light blue in color, are about 24” across on the sides and 16” across on the rear door, but have no evidence of the white world outline of olive branches). I suppose they could be an Earth motif from some movie, but I am not sure. I also found the serial number markings "U.S.A" and "40149719" on either side of the back door. One of the markings that I found and really intrigues me was the word " Princess ". It was in a real neat and somewhat whimsical, wavy hand painted lettering. It was light olive color with red highlights to make it appear three dimensional and varied in height from four to six inches. This marking was not on the bottom layer of paint and was above on of the tan layers on an olive drab layer, so I am assuming the studio placed it there. I received an e-mail from the President of the Bionic Woman fan club on Yahoo. He says that my halftrack was in episode #42 "African Connection" of that series. Actor Don O'Herlihy was driving it with Lindsay Wagner riding along. This is where the “Princess” name is from as well he stated.